Beautiful You: Teen Blog Series Week 3 | Favourite Highstreet Shop and Picks! Teen Blog Series Week 3 | Favourite Highstreet Shop and Picks! Another Monday has rolled around which means that it is time for another Teen Blog Series instalment! This week is all about our favourite high street shop and what our top picks are within this shop, picking this was actually so hard but I have been able to get it down to ten items! My current favourite high street shop is Topshop as there are so many items in there that I love at the moment! I know it is on the more expensive side of high street but sometimes I really don't mind paying a little bit more if you get better quality clothes! I have selected a few items that I love from the shop and I will go through them for you and try and explain how I would style each piece! 1. Grey Baggy T-Shirts- as A/W gets ever close, despite my denial of summer being over, I have seen so many more grey t-shirts on the market. I think these are a perfect staple piece to any wardrobe as you can dress them down with a pair of leggings and a scarf or make it a bit more fancy with black jeans, heeled boots and a leather jacket, they are extremely versatile! 2. Floppy Hats- everyone has been loving Fedora hats recently especially all of my blogging friends and I have wanted to jump on the bandwagon but haven't found one I liked until now! I would style this with a pair of jeans, maybe with rips in and a nice floaty blouse and a cape as they are on trend right now! 3. Short- I am definitely going to stepping outside my comfort zone and trying to wear shorts with tights more often this Autumn. I saw these in the shop over the weekend and I thought that they would work both at the moment and they would be easy to style throughout the A/W. I would wear these with a nice plain white t-shirt or blouse, a blazer, thick tights and a pair of Chelsea Boots! 4. Loafers- I have always loved this style of shoes, they are usually extremely comfortable but look very effortless! Again you can easily dress them up and down for any occasion and from day to night. I love the fact that you can usually get them in loads of different colours so that again is an added bonus! I would style these with a nice pair of floaty trousers and a cami top, this is definitely an outfit that I would wear! 5. Scalloped edged t-shirts- I love taking a really plain and simple item and changing it slightly to make it a bit different, this is why I am loving these. Taking a straight edge and making it scalloped bring a whole new dimension to the top and it give the outfit the feel that you have made more effort than you actually have. I would style this with high waisted jeans and a nice grey cardigan for a simple, well put together outfit! 6. Jami Jeans- if anyone is on the curvier side and is looking for the perfect pair of jeans, look no further! I found a pair of jami jeans in the sale in my local shop in a size smaller than the size I usually am, me being me went to try them on to see if I could make a point and they fitted me PERFECTLY! These are the best jeans out there and I know they retail for £40 but if you can find them in the sale then buy them straight away. I would wear these with anything, I have been wearing mine recently with a crop top and an oversized shirt! 7. Floaty Trousers- I know these were very popular in the summer time but loads of shops have bought them out in A/W colours which is fantastic. They are extremely versatile and you can mix and match what you wear on your top half to get a variety of outfits! Simply wear a pair of dainty heels and they are perfect for going out or wear then with flip flops or a pair on cute flats and there you have a perfect day outfit. But I have to say, the colour of these trousers is what made me fall in love, I am a massive fan of royal blue, black and white together! 8. Frilly Socks- I love love love these socks from Topshop. They can give trainers a girly edge, so if you want comfort but style as well they are the perfect combination! I love the fact that you can get three pairs for £8, I think that is such good value for money as I have loads and they wash so well! I wear these socks with my Nike Blazers, my Converses or my skater shoes! 9. Blazer Coats- there are so many of these coats on the market right now but I love this one in particular. The light grey is very easy to match with a lot of colours and can be dressed up and down depending on what occasion you are wearing it for. I also love the fact that this is slightly longer and more tailored as it can really pull an entire outfit together. In my opinion this would look amazing with black ripped skinny jeans, slightly turned up at the bottom, a plain white v neck tank top, a massive silver statement necklace and a pair of loafers like the ones above. I'm literally swooning over that outfit, I want to go out and buy this coat but it does have a hearty price tag of £110!!! 10. Checked Shirts- I have been trying to channel my inner hipster recently, I don't know why but I love that kind of fashion and you can't be hipster without owning a checked shirt. This one is perfect as I am not a massive fan of red and most of the ones on the market are orientated around the colour red so this is brilliant! I would either wear this with leggings and some long boots or some mom jeans tucked in and some heeled boots! 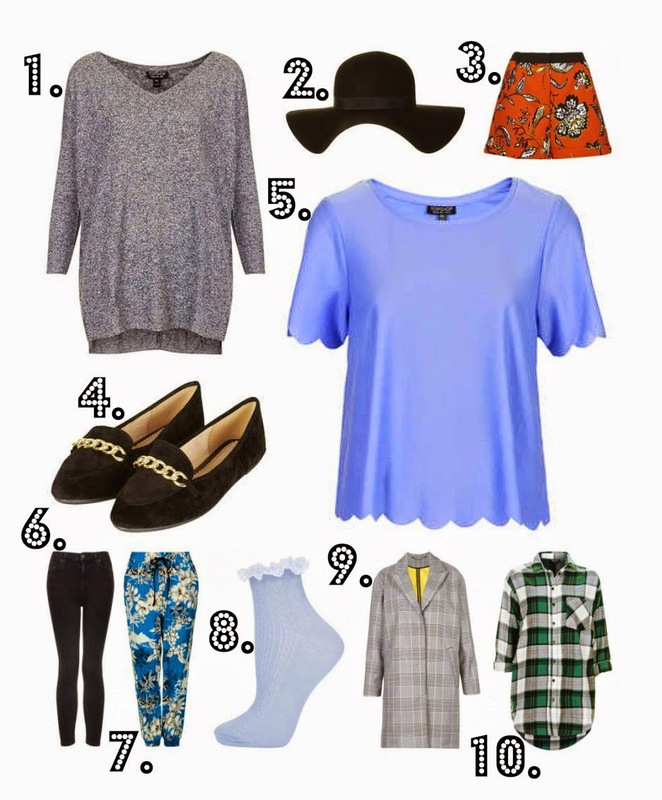 I know some of these products are on the pricier side but I do love Topshop clothes. None the less, I hope you enjoyed this post and as I said in my previous post I am going to be blogging everyday this week to celebrate my blog birthday. As well as this I am extending my giveaway for an extra week during my daily blogging so I will leave the link below so that you can go over and enter! I love all your picks! Especailly the the checked shirts and loafers. I included loafers in my post. I love checked shirts, they are so nice!